Frank Williams became the first Formula One team owner to receive a knighthood when he was recognized for his services to motor sport in Britain's latest New Year honours list. Although the award came at the end of the worst year in terms of results for over a decade, the Williams team has dominated Formula One in the nineties and in total has won nine Constructors' titles and seven Drivers titles since the team, in its present form, made its debut in 1978. Francis Owen Garbatt Williams was born on the 16th of April 1942 on Tyneside in northern England. His father was a wartime RAF bomber pilot and his mother a teacher of sub-normal children. After being cared for by his grandparents when his parents separated, he was sent away to a Scottish boarding school when he was just seven years old. It was there that his fascination with motor cars began and after being given a ride in a Jaguar XK150S, a legendary car at the end of the Fifties, he was totally hooked on motor racing. This somewhat spartan upbringing and the lack close parental attention seems to have bred a determination and independence that was to be a feature of the way he was to later run his racing team. He made his racing debut in 1961 driving an Austin A40 saloon, thereafter progressing to F3 racing both as a mechanic and driver. He financed his racing by buying and selling racing cars and became a well known name in the British racing scene of the sixties. He decided in 1967 that his future was not in driving and he then concentrated his energies as an entrant. He made his Formula One debut on the 16th of March 1967 at Brands Hatch, where he entered a Brabham BT26 for his great friend Piers Courage. This relationship was to end in tragedy the following year when Piers was burned to death after a crash in the Dutch Grand Prix at Zandvoort. Frank Williams would continue to enter a variety of cars for many different drivers - always using the current year's income to pay last year's bills - for another six years, before he gave up the unequal struggle of running his team on a shoe-string budget, and in 1976 he sold the majority stake in his team to Walter Wolf. By mid year Wolf lost patience with the lack of results and Williams was removed from day to day control. After a decade of effort with little to show for it in terms of hard results Williams was still determined to succeed, and in 1977 the current Williams Grand Prix Engineering was formed, but this time with a partner - Patrick Head. From the first time the FW06 appeared in the Argentine Grand Prix of 1978 it was clear that this was to be a new era for Williams. With Head looking after all things technical, Frank was able to concentrate his energies generating the income to finance the growing team at a time when Formula One budgets were rising sharply. In early 1986 he suffered the road accident which left him a quadriplegic, all the while the team he had built won the Constructors' title that year and again in '87. He showed the same ruthless determination on himself as he was later to show to others, refusing to allow himself any self-pity or thoughts of what might have been. He overcame the loss of the all-conquering Honda engines to McLaren in '88 by forging a link with Renault which survives through Mecachrome to this day. This ability to forge links with major engines suppliers has been an important factor in his team's success over the years and looks likely to continue with BMW. First and foremost, though, Frank Williams is a racer, an enthusiast. He appears to have maintained his childlike enthusiasm for racing cars and racing drivers, whilst developing the corporate skills to guide his company through the pitfalls that have seen so many of his rivals disappear from the sport. He, along with Ron Dennis of McLaren, has created the model that all the pitlane now follows. Year after year it has always been that if you want to win, first you have to beat Frank's team. It is typical that in Frank Williams' response to his being knighted he should mention his team and not only himself. "I am truly delighted that the team's achievements in Grand Prix racing have been recognized in this way", said Sir Frank. Indeed, it is also recognition that British racing teams lead the way in many forms of motor sport and especially at its pinnacle - Formula One. This expertise creates many high paying jobs and much export earnings for Britain. Frank Williams, though, is unlikely to dwell too much on this honour or its ramifications for his team or the racing industry, for just like the titles his team and drivers have won it is now part of history. A new racing season will soon be upon us and the first race is barely two months away. 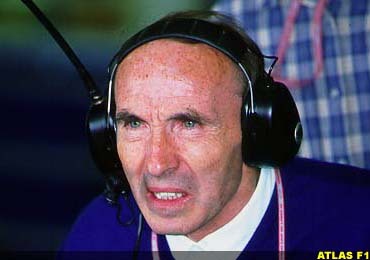 No one will be counting the days more keenly than Sir Frank Williams. Roger Horton � 1999 Atlas Formula One Journal.